Philadelphia police arrest a suspect, in red hoodie at right, on Tuesday morning at the Community College of Philadelphia after reports of a gunman put the campus on lockdown. 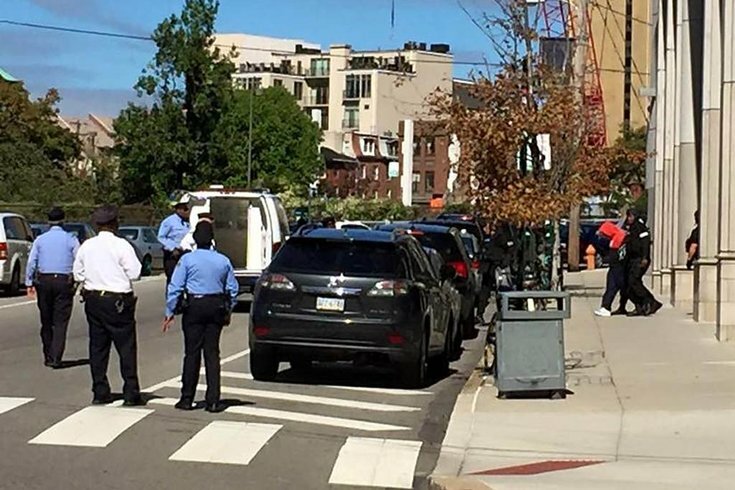 It was a tense Tuesday morning at the Community College of Philadelphia when, at about 10 a.m., the school was locked down after a gunman was reported on campus. During the morning, students kept outside the locked school were reportedly confused about the situation as members of the police and a SWAT team responded to the school, and began searching the Bonnell Building, located between 16th and 17th streets on the campus in Spring Garden. "I don't know if it's a gunman or a suspicious device. They are just taking precautions," said Speen Khan, 19, a freshman at the school when students were initially locked out of the building. Later, police said that the school was locked down after a dispute between two men led one to allegedly threaten the other with a gun in a classroom. But while many were cordoned off from the campus and kept in areas along Spring Garden Street, many students, faculty and staff on the school's campus were locked down in the school during a nervous hour or so while the police searched rooms for the suspect and evidence of a weapon. No shots were fired and there were no reports of any injuries, said Tanya Little, a spokeswoman for the Philadelphia Police Department. Just before noon, Little said that 17-year-old male was apprehended. Authorities were still searching for a weapon, police said shortly after the suspect's arrest. "I'm terrified," said Kevin Casey, 23, a junior at the college, as the search unfolded. He was texting his professor, who was locked down in school. Gracie Hudson, 19, a sophomore at CCP said her roommate was hunkered down inside the building. "My roommate is in the building now," she said, as the authorities searched campus buildings. "She locked herself in the one-person bathroom." As news of a suspect being apprehended in the incident broke, students gathered outside said they were relieved that the incident wasn't much worse, and some said that locking down the school was too extreme a response for an incident in which no shots were fired and no gun had been found by police. Others recalled a recent Internet threat made toward area colleges as a worthwhile reason for the police response. "This is ridiculous," said Denise Morse, 27, a senior at the school. "If there was a blizzard or something, OK, they have no choice but to shut down. But, not for this right here." Freshman Aminata Sesay, 27, disagreed. "A friend of mine is still in there. I talked to him over text. He said that the police came in and searched everyone in the room for weapons," she said. "I'd rather be safe than sorry." Just after noon, all students were let out of the lockdown and the college canceled classes for the rest of the day. "I'm relieved, but, it's not fun having all of these false threats," said Thomas Cartegena, 19, a freshman at the school as he left the scene. As a precaution, the Masterman School across Spring Garden Street from the college was also placed on lockdown. The Community College of Philadelphia, the largest public institution of higher education in Philadelphia, has about 15,000 full-time students. The incident comes just one day after an online threat of violence against local universities in the Philadelphia area had students and residents on alert. Ramsey said there was no evidence, however, to suggest that Tuesday's incident was related. PhillyVoice staff writer Christina LoBrutto contributed to this report.